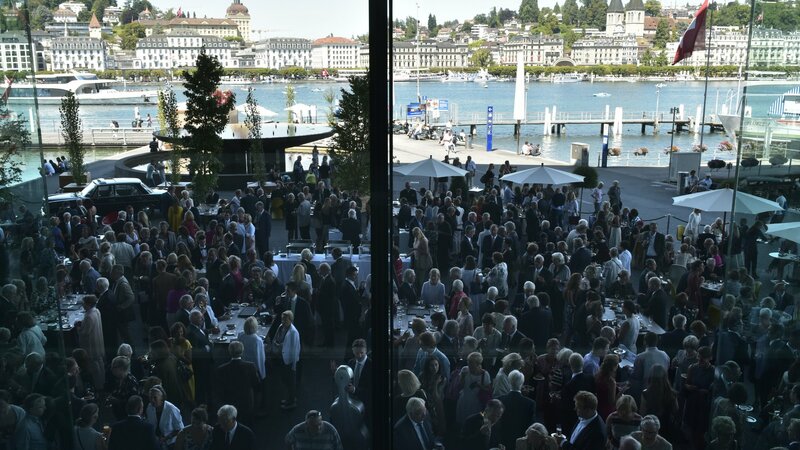 The Foundation Friends of LUCERNE FESTIVAL celebrated its 50th Anniversary on 14 August. The exclusive private concert, funded by a bequest from Ernest I. Ascher, enthralled the audience with works by Shostakovich and Tchaikovsky. Maestro Riccardo Chailly, the new principal conductor of the LUCERNE FESTIVAL ORCHESTRA, paid his respects to the audience at the conductor’s podium. Six hundred Friends and guests celebrated together. Once again, many thanks to you, dear Friends: without your support and your enthusiasm for music the LUCERNE FESTIVAL would not be what it is today. Please allow us at this point to take a brief look back: at the time of its founding, the circle of Friends was small and predominantly local: a select group of Lucerne residents came together to promote the International Music Festival (IMF). This pebble thrown into the water created ripples and little by little, music friends from all parts of Switzerland joined. The greater Zurich area always played a special role in this context. Today’s circle of Friends includes many music lovers from Switzerland and from abroad; they are united by their mutual enthusiasm for the LUCERNE FESTIVAL. The internationalisation of the Friends has gone hand in hand with the reputation that our Festival enjoys worldwide – from New York to London to Tokyo. If we want to maintain our leading position among the classical music festivals we must continue to open our doors to other countries. Strong local ties cannot be played off against internationalisation. We are, and will remain, to be deeply rooted in Lucerne and closely connected to the residents of Lucerne – as we have been for almost 80 years! Today, our Friends come from the USA, the United Kingdom, Israel, France, Hong Kong, Spain, Germany, Austria, Belgium and Japan. This global network was established with the help of consistent and long-term development work. We are proud to be able to sustainably support such an incredibly successful Festival. The Friends are a key pillar of the Festival. Let us not forget that every year the Friends fund about 8 per cent of the entire Festival budget with their contributions, and if that were not enough, they also purchase nearly one fifth of all concert tickets sold. Since 2012, we have also had a small and yet continuously growing circle of Young Friends. The circle includes some fifty members – consisting in part of some of our daughters and sons who will be our successors and our future. Even more importantly: they are the best proof that young people – against all prejudices - are enthusiastic classical music lovers.